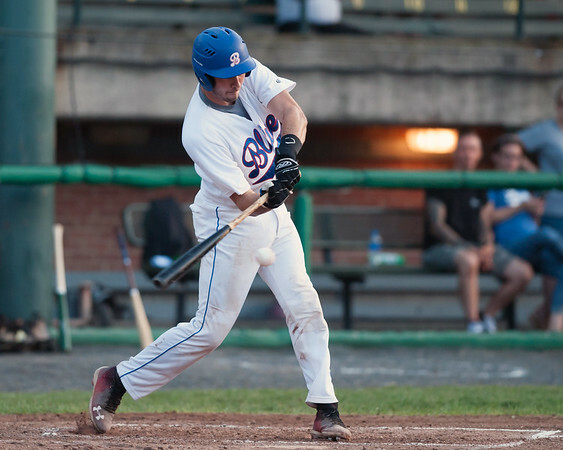 BRISTOL - Bryce Ramsay has asserted himself as one of the best hitters in the Bristol Blues lineup, but it was only a few short months ago when it didn’t look like the University of Hartford catcher would even be playing this season. Yet here Ramsay is, months after needing “nearly three-quarters” of his left index finger removed following a freak accident. Ramsay got the finger caught in a steel door just a week before the college season started, breaking it and ripping most of the skin off. The finger was reattached, but Ramsay was still out of baseball activities for over two months. The injury didn’t shy the Blues away from wanting to add Ramsay on to the roster. In fact, manager Ronnie Palmer didn’t even know about it. From the manager’s perspective, it doesn’t even seem as though anything happened. Ramsay admitted that getting back on the field was nerve-racking at first. But once he got some at-bats and innings under his belt, he was OK.
Ramsay hasn’t let the injury or the time missed affect his productivity on the field. The Barkhamsted native has a .359 average in 12 games this season for the Blues, the second highest on the team. His 14 hits and eight walks combine to give him an on-base percentage of .468, also the second best among Blues hitters. The offensive surge comes a year after Ramsay struggled in his freshman season at Hartford, hitting just .115 in 32 games. But this summer with the Blues has given the catcher a newfound confidence in himself. With the Blues headed into the Futures League playoffs next week, there’s no doubt Ramsay will be a prominent figure on the squad. Considering what he has had to overcome, the Blues couldn’t ask for a better person leading the postseason charge. Posted in The Bristol Press, Bristol Blues on Friday, 3 August 2018 21:11. Updated: Friday, 3 August 2018 21:14.